I can remember when I was a child that I often had earaches. Nothing makes you feel worse than to have this aching pain in one or both ears. During the summer, I used Swimmer's Ear regularly and even then, I would still get the occasional earache. About 75% of children up to age seven, as well as adults, divers and air travelers suffer from earaches caused by the accumulation of liquids and air in the middle ear. Thank goodness that now there is a noninvasive and non-medicinal way to treat these ear infections. The Eardoc is designed to open the ear tube, draining trapped fluids from the middle ear and relieving pressure from the eardrum. 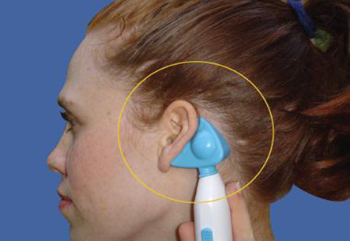 It will open the ear tube in a completely noninvasive way. Keep reading to find out more about the Eardoc! I reviewed the Eardoc, which retails for $55.00. I didn't have an earache at the time, but I tried it on myself just to see how it works and how comfortable it felt. 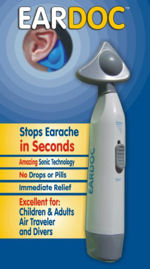 Simply place the Eardoc behind your ear and slowly turn on the device. The earpiece will begin to vibrate vigorously and at first, may seem a little rough. You quickly get used to it though and can soon tolerate a little more. When you have reached the highest level you are comfortable with, continue using it for up to one minute. This device can be used on anyone over 1 year of age. The Eardoc will continually shake the tube in your middle ear, dislodging built up fluids and trapped air, which makes your ear feel MUCH better! Watch Wanda Wee Wee and I demonstrate how to use the Eardoc correctly. Remember, this device is not supposed to be used on children younger than one year old. You will also need two "AA" batteries to operate the Eardoc. As you can see, it's super easy to use and very lightweight and portable. You are even allowed to use this device on airplanes so that you no longer suffer from the ear pain associated with cabin pressure changes. The Eardoc is now a permanent fixture in our medicine cabinet and will definitely be in my carry-on bag the next time my family travels by plane! Disclosure: I received the Eardoc in order to facilitate my review. No other compensation was received. This product review is based on my own personal experiences with this item and is completely honest and objective.